The Securities Enforcement Empirical Database (SEED) tracks and records information for SEC enforcement actions filed against public companies traded on major U.S. exchanges and their subsidiaries. Created by the NYU Pollack Center for Law & Business in cooperation with Cornerstone Research, SEED facilitates the analysis and reporting of SEC enforcement actions through regular updates of new filings and settlement information for ongoing enforcement actions. The variables tracked include defendant names and types, violations, venues, and resolutions. -- Professor Stephen Choi, Director of the Pollack Center for Law & Business. 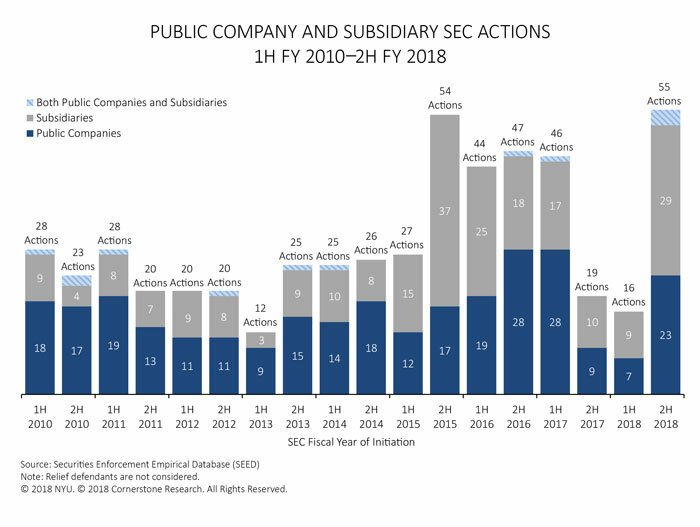 The SEC filed 55 new actions against public companies and subsidiaries in the second half of FY 2018, reversing a decline in filings that began in 2H FY 2017 and continued into the first half of FY 2018. The SEC continued to bring the substantial majority (85 percent) of public company and subsidiary actions as administrative proceedings in FY 2018. Almost half (45 percent) of public company and subsidiary actions involved Broker Dealer or Investment Advisor/Investment Company allegations. For the fourth consecutive fiscal year, more than half (61 percent) of FY 2018 settlements with public company and subsidiary defendants noted some form of cooperation with the SEC. The SEC imposed monetary penalties on 89 percent of public company and subsidiary defendants that reached settlements in FY 2018. Monetary settlements in public company and subsidiary actions totaled over $2.4 billion in FY 2018—more than the total in any fiscal year since at least FY 2010. For press inquiries about NYU, please contact Michael Orey at Michael.Orey@nyu.edu. For information about this site, including access for academic scholars, please contact law.seed@nyu.edu. For press inquiries about Cornerstone Research, please contact Terri Viera at tviera@cornerstone.com. For information about Cornerstone Research materials on this site, please contact sec_research@cornerstone.com. View the recently released FY 2018 update report on SEC Enforcement Activity against Public Companies and Subsidiaries.